Thirteen years after their first release, Desert Sweets reunite on A Place Meant for Birds, recorded live at the Outpost in New Mexico. The trio consists of Biggi Vinkeloe from Sweden on alto sax and flute, Bay Area double bassist Damon Smith, and Albuquerque native Mark Weaver on tuba and didgeridoo. The intimacy of these seven improvisations gives us the chance to appreciate the group’s complementary powers of reception and reaction, listening and responding. “Vision is a long tumble” opens the outing at a modest pace, a bit subdued perhaps, with extended tuba and bowed bass textures supporting Vinkeloe’s wandering alto lines. As the piece develops Smith’s physical playing is especially dynamic, moving back and forth from arco to pizzi, from the low register to the high. Near the end of the track the trio comes together nicely in sustained, rising strata of sound. The shorter follow-up, “White bed,” takes a wholly different approach, showing us a new side of the group. Here the playing is urgent and dense from the start, with Weaver squeezing small bubbles out of his tuba, Smith frenetically plucking strings, and Vinkeloe gasping for air between phrases, her saxophone keys fluttering. Moving forward the trio works between these extremes, keeping the level of invention high. 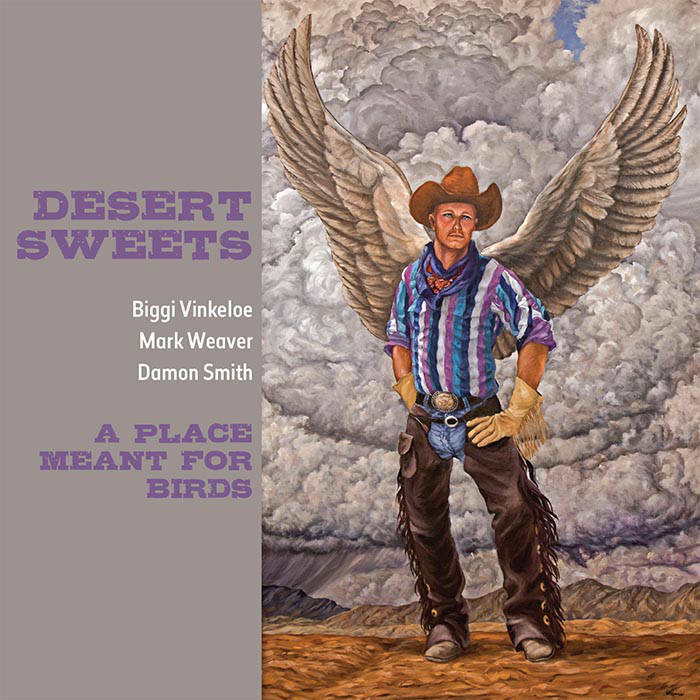 On “Not Salt” I love the grainy, warbling tone Weaver draws out of the didgeridoo, and the melody, heavy with pathos, Vinkeloe lays over Smith’s rich bowing. The longest improvisation, “Silt” builds gradually in intensity over 15 minutes three sections, with Vinkeloe on flute for the first time. “The Wind has Taken my Breath,” the penultimate piece, features Lisa Gill reading her desert-themed poem, from which all the track titles have been drawn. Finally, on “To Spill a few Birds,” Vinkeloe takes up the flute again, concentrating on a hauntingly beautiful motif tense with multiphonics. The effect, at the close of such a tirelessly exploratory album, is one of relief and great reward.